Made of genuine mouth-blown lead crystal for superior sparkle and durability, the Riedel company offers its most distinguished decanter, combining delicate artistry with purposeful engineering. With two smooth areas for the wine to rest, the serpentine form double-decants the wine, allowing two opportunities for sediment from old wines to filter down before pouring into glasses. Similarly, a young wine's bright tannins and youthful exuberance will be doubly softened and mellowed for the perfect tasting experience. One Riedel Boa Crystal Decanter. Gift arrives presentation-ready in a gift box, and is securely packaged to safeguard the shipping process. A complimentary card with your personal greeting or message is included with your gift. The Riedel glass dynasty is built on the creative energies of over 25 generations of glassblowers. Since 1756 in Bohemia, their legacy continues through the present day, with a worldwide span of customers and an unassailable reputation for top-flight glassware. Riedel Crystal Boa Decanter is a hand delivered gift. These gifts are delivered by one of our local design centers located throughout the United States and Canada. Same day delivery is available for most gifts when ordered before the cutoff time. 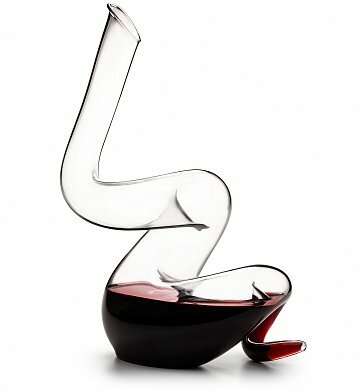 The cutoff time for Riedel Crystal Boa Decanter is 1 PM in the recipient's time zone. Release the flavors and aromas from your favorite bottle of wine. Drip-resistant pour spout, wide opening for easy transfer from bottle to decanter. Made from 100% mouth-blown lead Austrian crystal.